Black hardwood flooring is all the rage these days…not just dark hardwood floors, but black hardwood…or as close to it as you can get. There is no better way to make a statement in your home than with truly dark black. 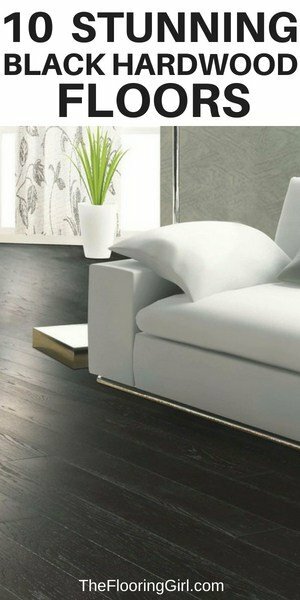 Black floors give you a modern look. They look upscale and up to date. The challenge is that many hardwood floors are simply dark, and they aren’t as black as many people are looking for. So, I wanted to first share how to get truly black floors…or at least get them as close to black as possible, as well share some great pre-finished black flooring options. 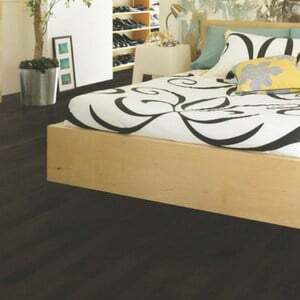 Currently, dark floors are the most popular (see more at Hardwood flooring trends) and the darker the better. I’d say that the most popular color is a 50/50 blend of ebony and dark walnut. But for many people, this isn’t dark enough. And, they are disappointed when they see the stains tested on their floor, because they they are expecting to get something closer to black. Now, just a warning, things look different in real life vs pictures on the internet (most pictures look darker), so do bear that in mind. Also bear in mind that the stains look different pending on the species you have (e.g. red oak vs white oak (which is darker) vs pine vs maple…you get the idea), as well as the grade of wood. But, I have a few options for you, if you’re looking for a much darker wood stain – something closer to black where you can barely see the wood’s graining. In fact, I have 4 options for you. 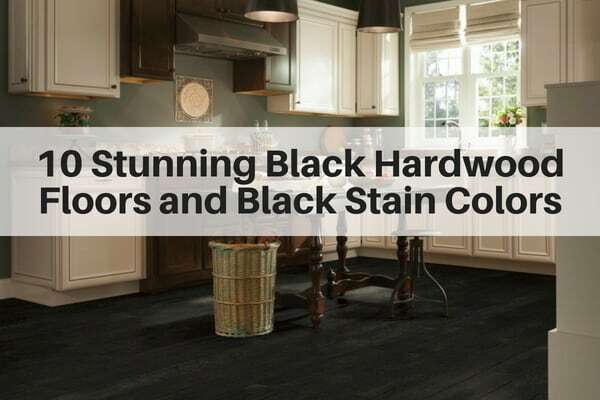 Since darker and darker stains have increased in demand, Duraseal recently introduced a new stain color called True Black. It is the darkest stain out there and it’s pretty opaque so that you barely see the wood’s grain. The picture on the right uses True Black. The true black really gives a striking look and contrasts so well with white walls, white wainscoting or white cabinets. It also works really well with gray (see most popular shades of gray). For some people, True black is just too dark (and yes, it is more challenging to maintain). For those that feel this way, ebony may be a better choice. Ebony is a very cool color, but the stain is translucent, so you can still see the graining on the wood. And, of course, many people choose a 50/50 blend of true black and ebony. Above you can see true black (left) vs ebony (right). Bonus Tip: Over the last several years, we’ve had a number of customers asking how to camouflage the reds in red species such as Brazilian Cherry, Mahogany or American Cherry. I used to advise people to use Dark Walnut on these floors, because these species absorbed the dark walnut more than the ebony (even though ebony comes out darker on oak…remember each species absorbs the stain differently). But now I advise them to test a blend of true black and dark walnut until they find the color they love. Another solution to make your floors look a bit darker is to do a water pop. Water popping is a process that opens the pores in the hardwood for more consistent stain penetration. It will make the stain color look more even and it will allow you to do go a bit darker and deeper with very dark stains. Please note that this is an extra step and will cost a bit more money. And, importantly, you want to have an expert who is familiar with the process. If you goof, you will have to start fresh again and start over (i.e. resand the floors). Please also note that this process should really just be done on oak. You should not do this on maple, pine, birch or other closed pore woods as it will have the opposite effect and instead make the floor look blotchier. For these woods, you need to add a conditioner to close the pores (not open them). You can read more about water popping here. Note: This is not my first choice to make hardwood floors darker, and it will only make your floors a bit darker. The reason I’m not crazy about this solution is that adding stain to the poly weakens the polyurethane a bit. (Polyurethane is what gives the floor its protection). But, there are times when a customer has stained the floor and they just don’t feel that it’s dark enough (even if they tested/approved the stain). And, then this is a good back up plan to make the floors a little darker (rather than resanding the floors and starting from scratch…and also much better than adding a 2nd coat of stain which can result in peeling over time as the 2nd coat of stain doesn’t fully penetrate the wood and creates weaker adhesion with poly). 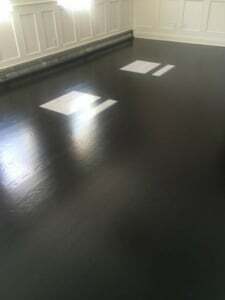 Because the tint can weaken the polyurethane a bit, it’s important to make sure you have 3 coats of poly on the floor. If you were only planning to do 2 coats of poly, I’d recommend that you think again in this case as your floors will wear down faster. 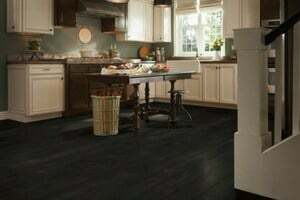 The 4th option for super dark or black floors is aniline dye. This can really give you a jet black look. The dye provides a dark, dramatic and upscale look. But, it is pretty difficult to use, so you want to hire an expert here…not just a refinishing expert, but someone who is very familiar and comfortable using aniline dyes (Note: Most refinishers do not provide this service). Why is it difficult? The dye dries quickly so there’s a lot of room for mistakes and it’s easy to see lap lines or stop marks in the end product. Aniline dyes are sometimes used in species that are more challenging to refinish (e.g. maple, birch, cherry). You can make the dye appear even darker by going over it (unlike a floor stain) until you get it jet black. Penetrates all parts of the wood evenly, including the graining so it reduces color variation within a plank as well as across planks. With a dark dye, it will cover imperfections in the floor, especially if your floors are a bit older. You need to apply stain on top of it to lock in the color. The dye isn’t color fast and fades when exposed to UV light. Most installers don’t offer this service and/or are not adept at this. In fact, many installer don’t even know what it is. If you’re going to use aniline dye, it’s easiest to work with a water soluble dye. Alcohol soluble dye dries extremely fast and is therefore more challenging to work with. You can use either the power or liquid form. But, be sure to measure carefully and make sure the testing sample is the same ratio as what’s used for the whole floor. To learn more about the application of Aniline dyes, check out this video by Philadelphia Floor Store Inc. I think they did an excellent job with it. If you are buying new hardwood floors, you have the option to buy pre-finished hardwood floors. 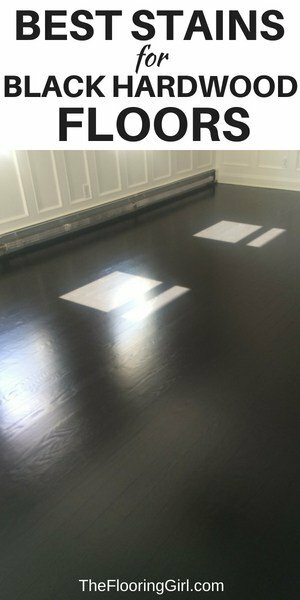 While I generally prefer site finished floors (see: site finished vs pre-finished hardwood floors), when it comes to finding black hardwood floors, it’s sometimes easier and less expensive and more convenient to get pre-finished hardwood floors. 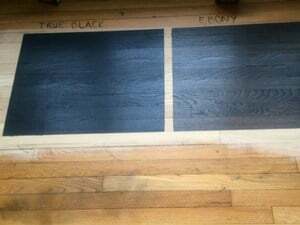 So, here are some options to buy pre-finished black hardwood floors. I would recommend that you order samples or look at these in person as everyone’s definition of black/dark is different. And, sometimes pictures on the internet look different (and sometimes they are mock-ups), so better safe than sorry. Oh, and in case you’re wondering about solid vs engineered hardwood, you check out the pros and cons of solid and engineered wood here. 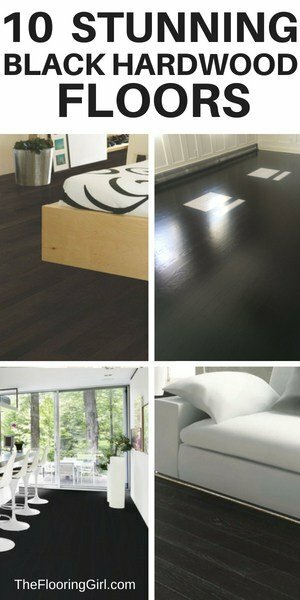 Here are some great choices for black hardwood flooring that’s solid wood. To learn more about them, just click on the pictures. 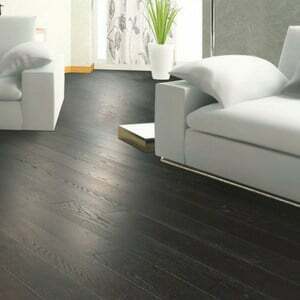 Here are some great black hardwoods in an engineered format. To learn more about them, just click on the pictures.